My birding friend and I were on a mission a few weeks ago. We had seen a picture of a Mandarin Duck while we were at the San Diego Bird Festival last year. The photographer said that he took the picture at Lake Jennings a couple days earlier. We drove directly over to the lake and as you would have it.....No Mandarin Ducks. It had been a year but we couldn't get that duck out of our minds. One afternoon, we looked up "Mandarin duck" on Google and found this guy that said he saw them at Lake Irvine. So, off we went to Lake Irvine. When we got there the place was closed due to someone shooting a movie there and closing the Lake to the public. Once again.....No Mandarin Ducks. Then my birding buddy's daughters boyfriend (confused yet?) bought a new camera and was showing her some pics he had taken on her TV. 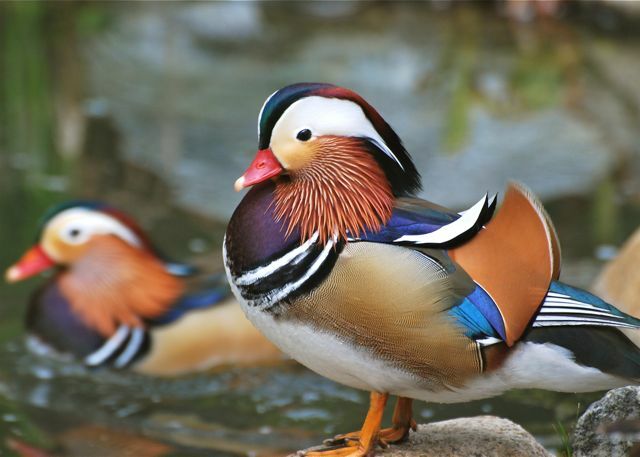 As he quickly scrolled through pictures of railroad tracks and cool looking graffiti, up popped a Mandarin Duck. She said, " What the heck? Flip back, what was that?". Come to find out, a couple pairs of Mandarin Ducks had settled in his backyard and were hanging out by their Koi Pond in Yorba Linda. What are the chances of that? We made an appointment and went over and I took some beautiful shots of the Mandarin Duck. You just never know where you will find beautiful birds.